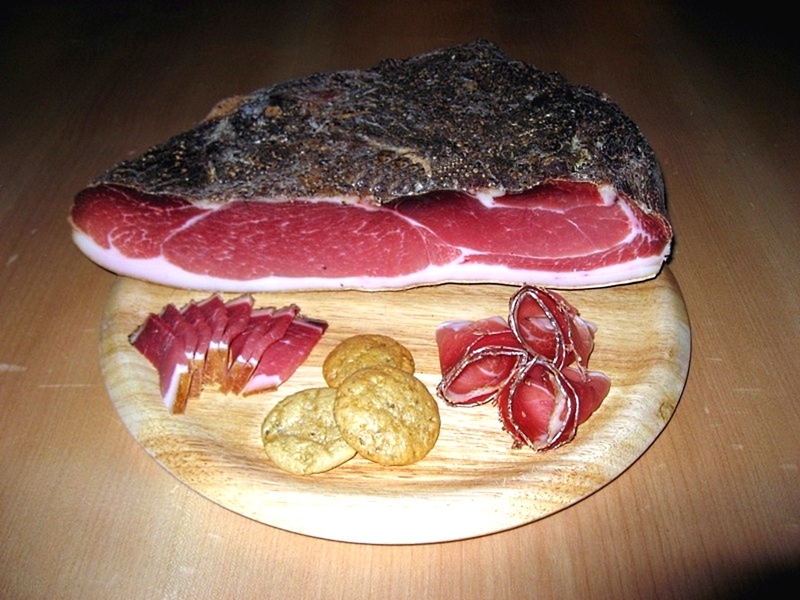 We can offer you a 1/4 flitch bacon speck (about 1 kg) produced in traditional manner by the butchery "Hell" Welsberg located in the beautiful Pustertal valley in Italy. The South Tyroleans are well known for their skills to work up pork. 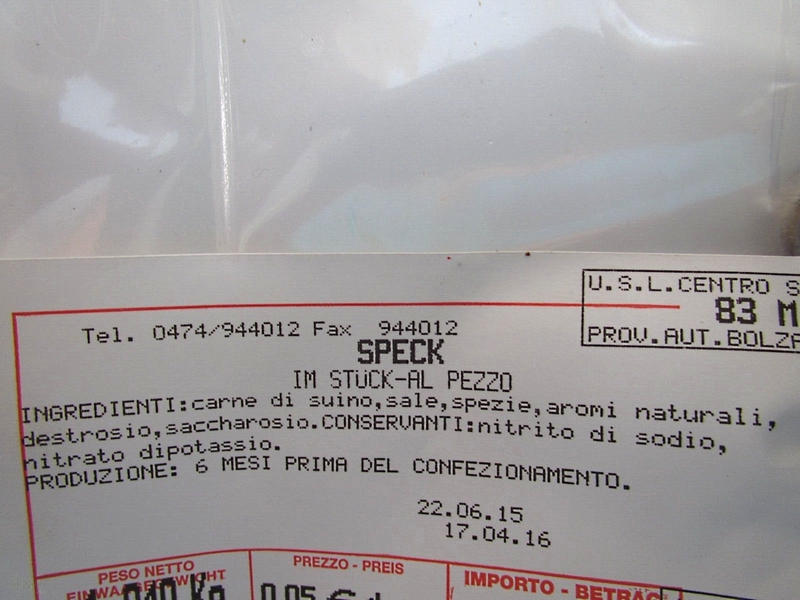 Combined with the local climat comes out a typical speciality simply called "Speck" in Italy. We can offer you two different types: Made by belly of pork, which means being quite fat, the product reminds you of a normal stuttered, smoked bacon. If it's made out of gammon, which means being quite meager Characteristic fort hat product is the special and sumptuous way of smoking, which has to be seen as the most important step in the production process. It has to be done correctly and strictly following the tradition. After being pickled in a salt brine for severeal weeks and being treated with several kinds of herbs, the pork is ready to fumigate. The whole process has to work perfectly.The surrounding climat, duration and even the kind of wood being used is prescribed. Only fir and pine is getting used, together with some juniper berries, to give the smoke a typical flavour. This flavour transfers to the meat and creates a unique taste. Kept in a dry, aerated and if possible dark room, this bacon is durable for quite a while. Mostly it is getting served with other cold cuts as an appetizer. But certainly "Speck" can be used for other things. The more matured "Speck" is, the more it can develop the spicy flavour and full taste. It is important to take the bacon out of the vaccum several hours, ore even days, before eating it. Put it on a soup plate and cover it with another one. Like this it can "breathe", evolve the flavour and get back the original consistence, being protected at the same time. Once open you can keep the bacon under room temperature in a dry place. If you want it to dry out slowly, keep in your fridge. Очень вкусное мяско. Качество превосходное. Всем советую. Доставка до одного из отдаленных уголков России еще и в Новогодние праздники всего 1,5 недели.